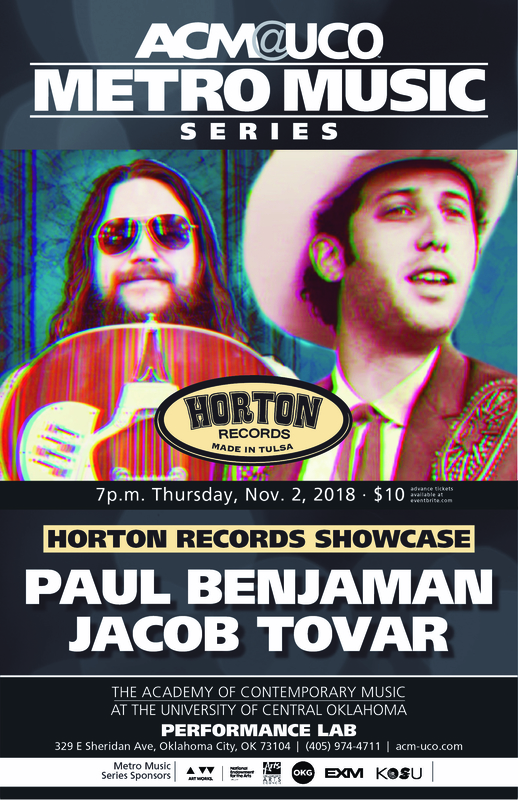 In a showcase sure to move country, rock and Southern rock fans alike, Paul Benjaman and Jacob Tovar co-headline a concert 7 p.m. Nov. 2 at ACM@UCO Performance Lab, 329 E. Sheridan Ave., in Bricktown. 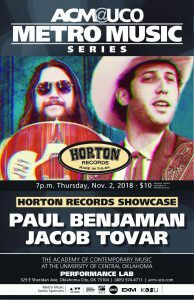 The event showcases Oklahoma musicians and Horton Records, based in Tulsa and founded by its namesake, Brian Horton. Horton Records is a nonprofit, volunteer-sustained music organization providing everything from band management to creating, sustaining and promoting local music and Oklahoma’s musical heritage. Horton Records, LTD is a nonprofit 501c-3 organization based in Tulsa, Oklahoma. Its mission is to provide support and tools for band management, promotion, booking, merchandising and distribution to help local and regional musicians fulfill their artistic goals and further promote local and regional music on a broader scale. Horton Records is actively involved in a variety of programs and workshops that stimulate, inform and engage future generations and other demographics in the rich musical heritage of our region. The nonprofit organization actively partners with other organizations and individuals to broaden and strengthen our community through our musical endeavors. Horton Records is an all-volunteer organization with no paid staff positions.